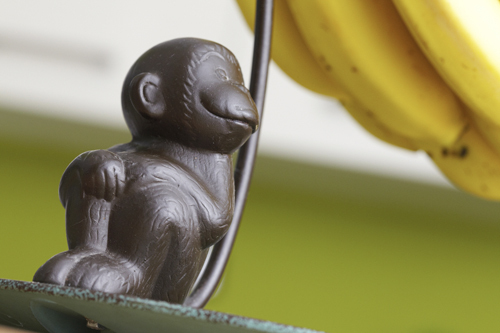 Many years ago, I was gifted this cheeky monkey banana holder by a chef in Chicago. He served a yummy banana cream pie on it in his restaurant. It is the ideal gift for me since I rarely go a day without eating a banana. Remember playing with a Barrel of Monkeys when you were younger? 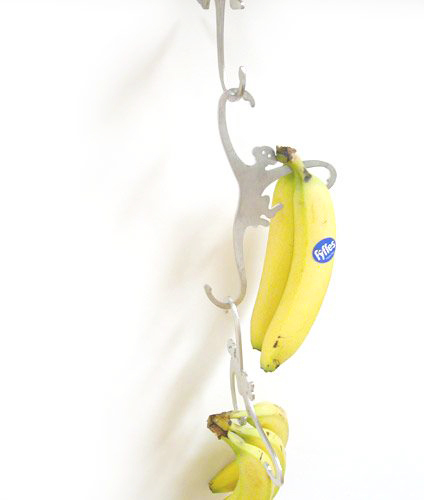 I love this hanging monkey banana holder that maximizes vertical space in your kitchen. 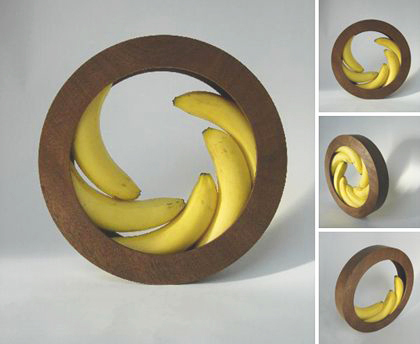 This slim, circular banana and fruit holder must be a feng shui DO with its smooth, harmonious shape. Made from gorgeous mahogany wood, designed by Helena Schepens. 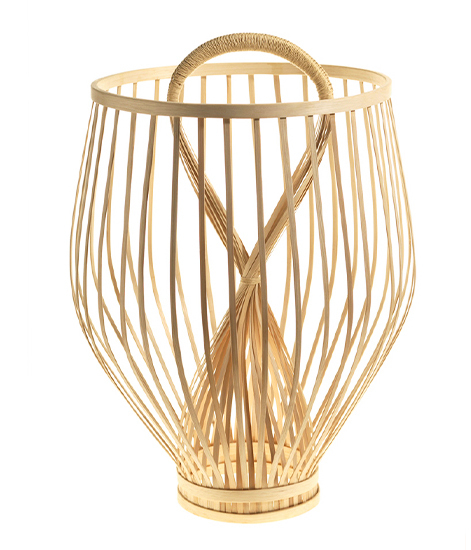 Sculptural and beautiful enough to stand alone when empty, I “heart” this bamboo fruit basket designed by Douglas Legg. Here’s the perfect pairing of wine with fruit…in ceramic. 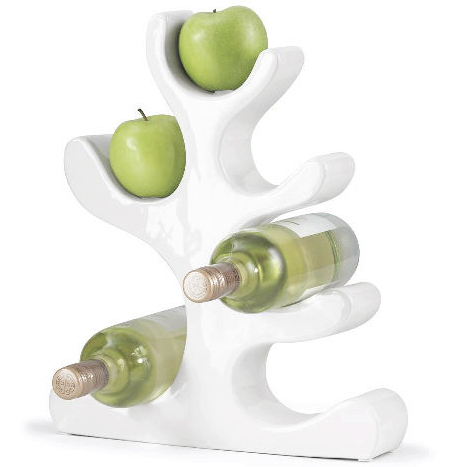 Makes me think about repurposing my acrylic wine rack as a fruit holder when my wine stash runs low. My brother-in-law called with a 9-1-1 design emergency! 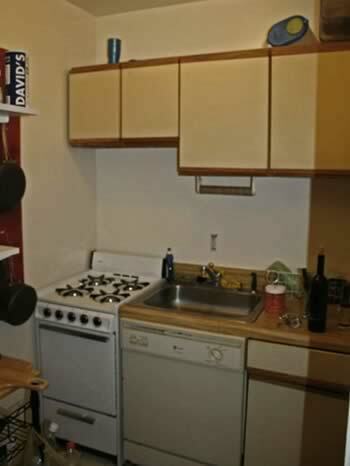 His tenant just moved out, and he only had two weeks and $500 to freshen up the kitchen. He has plans down the line for a complete renovation of the entire studio, but until then I had to put my DIY skills to task. The first line of attack was the cabinets. They are the typical melamine laminated cabinets you find in so many rental kitchens. Painting them was an option, but the bland kitchen was screaming for a more dramatic focal point. 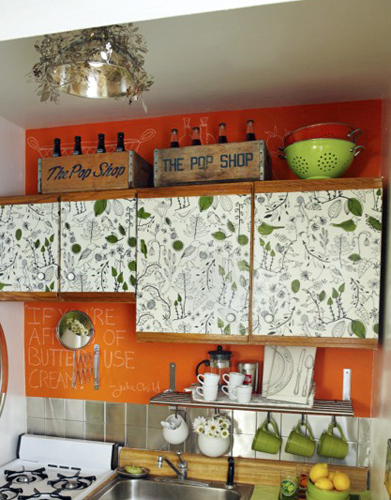 Decoupage with fabric is an easy, affordable and durable option for kitchen cabinets. This cotton fabric from Ikea ($5.99/yd) was heavy enough for the job and has a retro vibe that fit with the rest of the space. • If possible, remove cabinet doors from their hinges so you can work on them on a flat surface. I have also done this with cabinet doors attached so don’t worry. 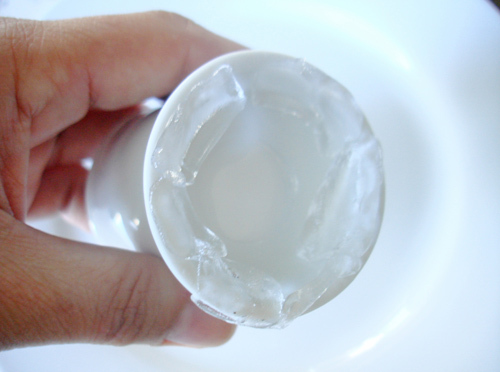 Protect the surface below because the glue can get messy. 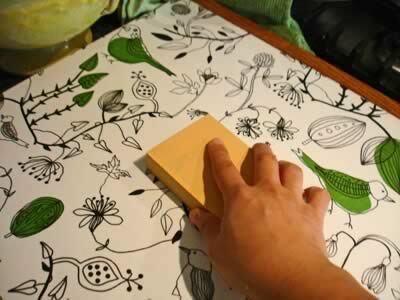 • Lightly sand the surface of the laminated cabinets. No need to sweat this. You just want to roughen up the surface a little. • Use a tack cloth and wipe off all of the dust. • Paint one layer of primer to even out the base color and to give the glue extra grip. Depending on the fabric, the base color might show through so choose white or off-white. Let dry. • Cut your fabric slightly taller and wider than the cabinet door. The extra salvage with allow for shrinkage when the fabric dries. You will trim the excess fabric when the Mod Podge dries. • Brush a generous layer of Mod Podge onto the front surface of the cabinet door. Next, brush a generous layer of Mod Podge onto the back of the fabric. Place the glued side of the fabric down onto the cabinet door so the pattern is straight and is facing up. Start smoothing out all of the air bubbles and excess glue. A damp sponge helps the final smoothing out process as well. Let dry. Should only take about 20 minutes. • Cut excess fabric from edges. This is easiest when the fabric is dry and a little stiff from the glue. • For a smooth, professional finish, wet sand in between decoupaged layers using a super-fine steel wool. Take the steel wool and dip it in soapy water (water with a drop of dishwashing liquid) and lightly rub all over the decoupaged fabric layer. Wipe off water with a dry cloth. • Repeat with one more layer of Mod Podge glue onto the fabric. Let dry and wet sand. • When dry, brush on a layer of clear acrylic sealer. It will protect the cabinet fronts and make them water-resistant. The total price for the project materials was $30. It does take a little sweat equity, but you will be happy with the durability of the cabinet finish. If you love the look of decoupage to add a custom touch to your petite space, check out this chic project here. My friend had a horrible light fixture in her kitchen rental and didn’t want to spend a lot on a light that she would have to leave behind. 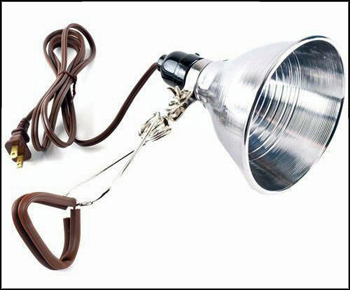 I adapted the metal shade from the clamp light and placed it over the hanging lightbulb. Because metal shouldn’t touch metal directly, I used a rubber washer between the lightbulb and where the metal shade touched. I draped the shade with the metal garland, which bends easily into any shape you need. 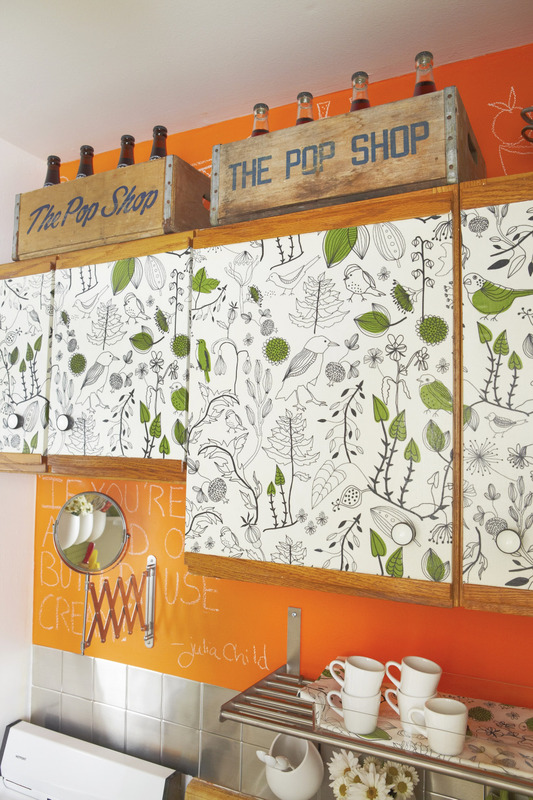 It adds just the right touch of whimsy to her kitchen and she can actually take it with her when she moves on. Give your kitchen instant Andy Warhol pop art status! 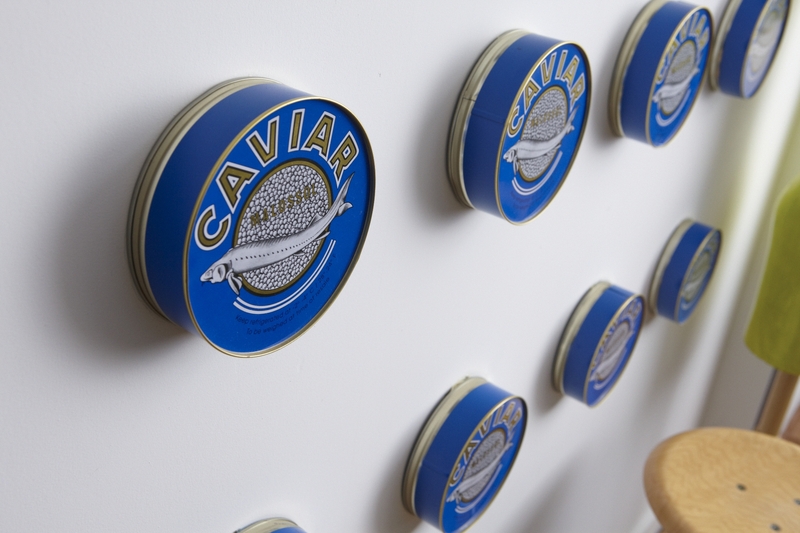 For $7.60 a piece, I found a great resource for brand new caviar tins that I installed on the wall and in multiples of three, twelve tins in all, my humble white kitchen wall is now my own personal pop-art gallery that brightens my day. You can find the tins at emarkys.com. Make sure and purchase the Italian Tin Traditional design in the 1,000 gram size. That is the largest size they offer. The company sells them wholesale and in bulk but I called their customer service number at 800-522-8427, and they were happy to sell me a dozen at a near wholesale price. 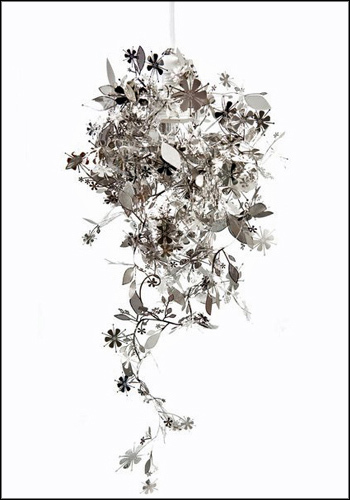 If you want to create a collage, keep in mind that the 1,000 gram size tin measures 6 ¼” in diameter and is 2″ deep. Attach adhesive cloth picture hangers on the back of each tin to hang on the wall with minimal damage. Just because you live in a tiny nutshell doesn’t mean you can’t throw an unforgettable party in your digs. 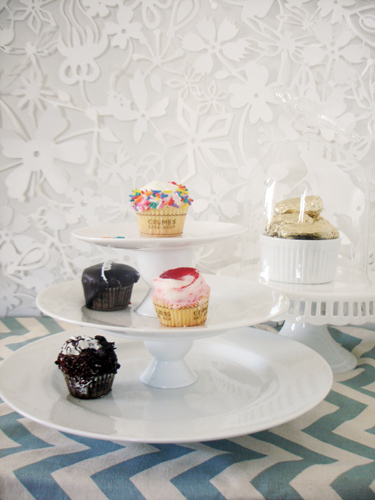 One sure fire way to impress your guests (and to distract them your lack of real estate) is to present food in the best light by giving them a lift onto cake platters and pedestals. But who has the cabinet space and budget to store a collection of party platters? Stack white plates gradating in size onto inexpensive egg cups. I like keeping the plates white so they appear seamless but for the holidays gold or red plates will look festive on top of white eggcups pedestal bases. Small white ramekins under the very bottom plate give the stacked plates an extra stable base. 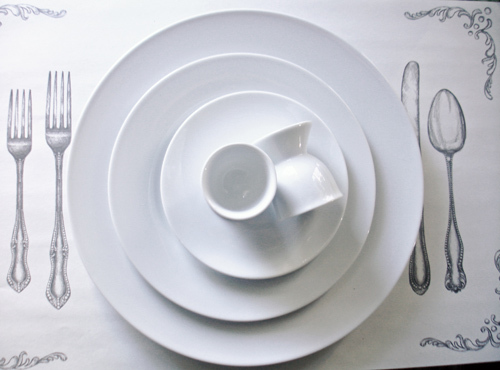 To keep your newly-stacked plates safe and secure, use clear Museum Gel. You can find it at places like The Container Store. An added plus is that the gel is reusable and non-toxic. 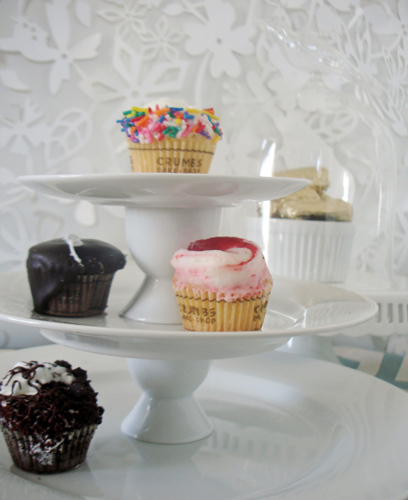 Even if you can’t cook or bake, displaying store bought baked goods and appetizers on pedestals will make everyone think you’re the hostess of the year!